Meanwhile, Gay Berlin surely holds its own. It actually mocks “Paree” in its Pariser Platz, named after the battle of Paris in 1814 that defeated Napoleon. This is also the location of the iconic Brandenburg Gate which became the symbol of German reunification after the Wall fell in 1989. 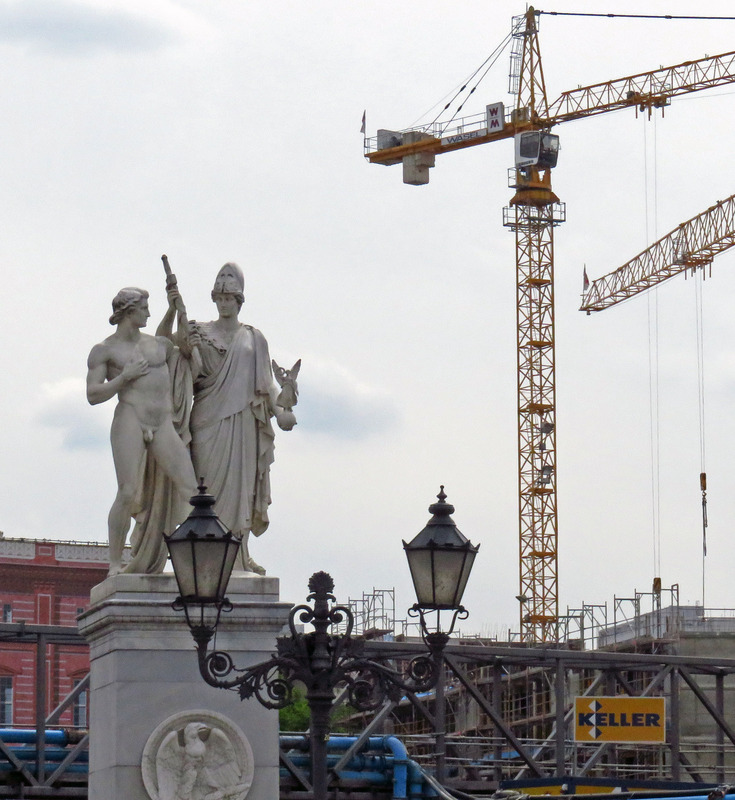 A walk along the historic Unter den Linden under the fragrantly blossoming linden trees will grant the views of classical sculptures next to new construction cranes, and take you to the major city sites, like Berlin Cathedral and Museum Island. 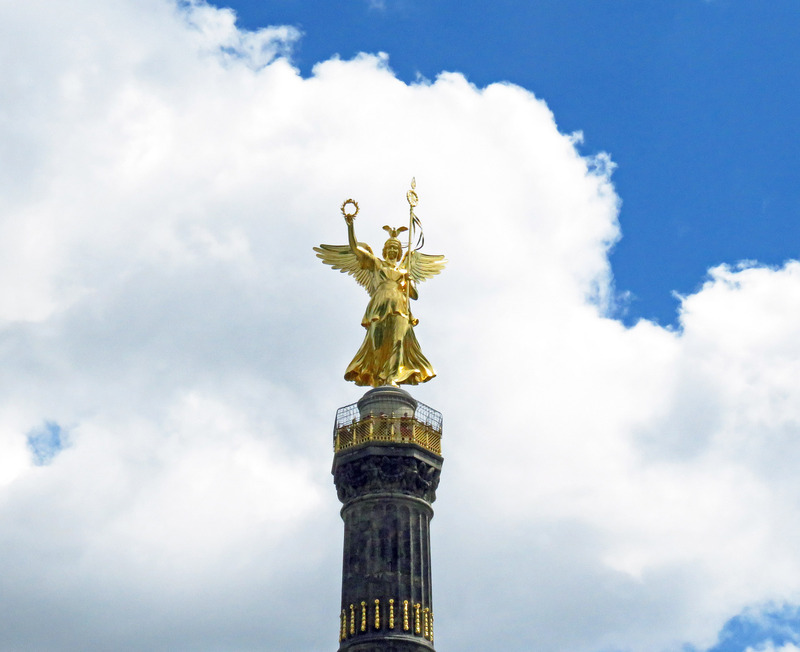 The best way to observe Berlin’s multiple monuments and architectural wonders is from a hop-on hop-off City Circle sightseeing bus that rides past the most important ones. Berlin Victory Column, designed by Heinrich Strack in the mid-1800s to commemorate the Prussian victory in the Danish-Prussian War, by the time it was inaugurated in 1873, acquired additional meaning after Prussia had also defeated Austria and its German allies in the Austro-Prussian War of 1866, and then France in the Franco-Prussian War of 1870–71 in the Unification Wars. 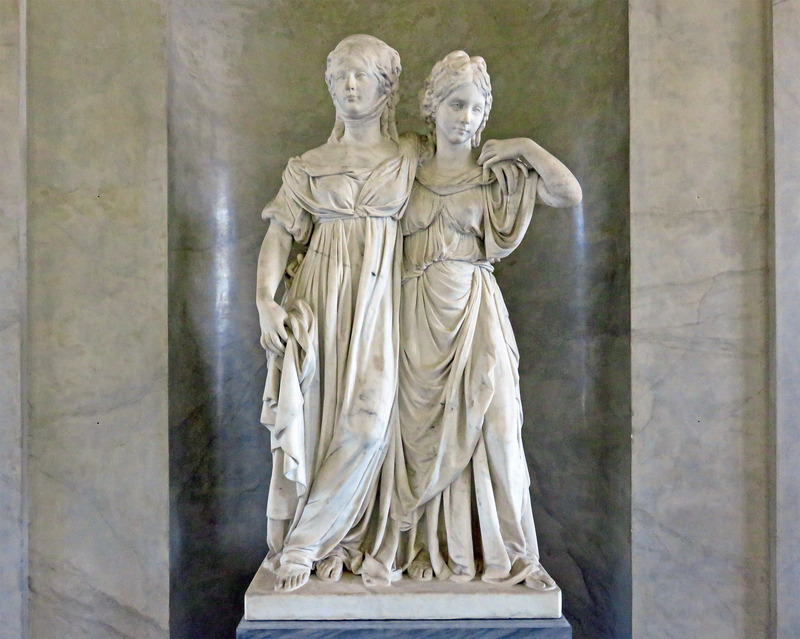 These later victories were reflected in the addition of the 27 ft sculpture of Victoria, designed by Friedrich Drake. The Rotes Rathaus (Red City Hall) is the red-brick town hall of Berlin, built in 1869 in Italian Renaissance style by Hermann Friedrich Waesemann is located in the Mitte district, where I was staying in a comfy and cozy Mercure Hotel Berlin Mitte, recognizable from afar by its wall-size “Berlin’s largest mural” on a side of the building. 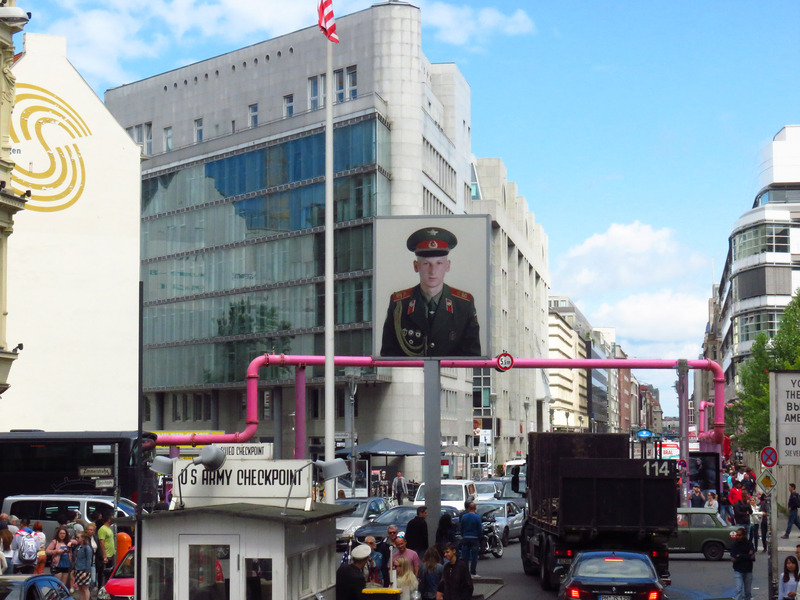 Checkpoint Charlie (the name given by the Western Allies to the best-known Berlin Wall crossing point between East Berlin and West Berlin during the Cold War of 1947–1991 can also be seen from City Circle bus that makes stops near all the sites along its route. Or, take U-Bahn – the fast and efficient city subway to the legendary Friedrichstrasse (very much comparable to Rue des Beaux-Arts) with its world-famous revue theatre Friedrichstadt-Palast, or to Charlottenburg district – home to Deutsche Oper Berlin on Bismarckstrasse (you’ll know you’re heading in the right direction by the composers’ names written on U-Bahn station tiled walls). Walk through a tree-lined Schlossstrasse to Charlottenburg Palace with exquisite Baroque interior and impressive collection of art, surrounded by serene park grounds with a lake. The Palast’s predecessor, the Grosses Schauspielhaus theatre was founded in 1919 by impresario Max Reinhardt, who engaged the amazing expressionist architect and interior designer Hans Poelzig, and artistic director Erik Charell. The theatre foyer with layered fountain-like columns led to a cavernous, domed amphitheater with stylized stalactites. This vast grotto was dramatically lit with colored lights, and the ceiling was dotted with lights emulating the night sky. Lavish, risqué revues, typical of Berlin’s decadent 1920s nightlife, were being produced, until the Nazis came to power, and everything changed. The building was seized in 1934, and renamed Theater des Volkes (The People’s Theatre). 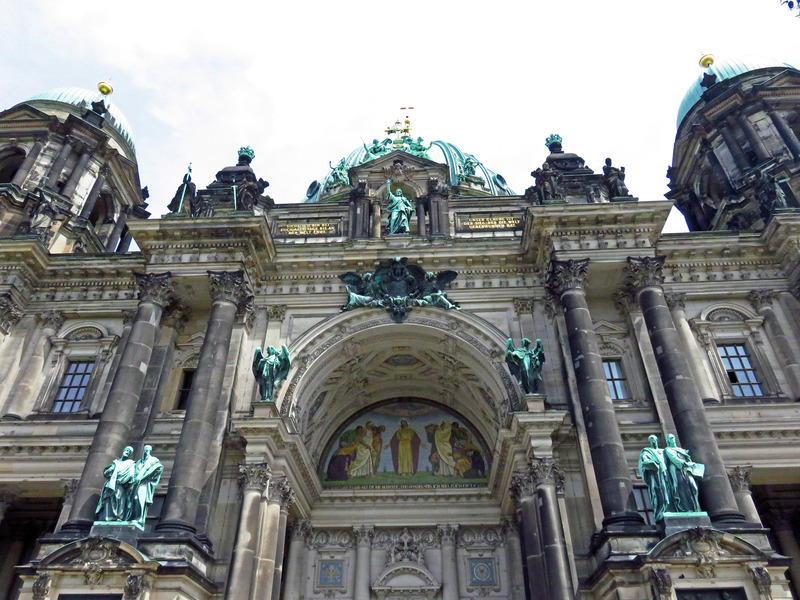 The spectacular vaulted dome was considered ‘degenerate architecture,’ and removed. Nazi propaganda shows were staged until 1945, when the theatre was damaged in a World War II bombing. Rebuilt and renovated in 1984, it became the flagship theatre of the German Democratic Republic (GDR) until 1990, and after the fall of the Wall, the Palast established itself as the first address in reunified Germany for extravagant and spectacular show entertainment. It continues to be Europe’s biggest and most modern show palace. Being of Jewish descent, homosexual, and modernist, the original theatre creators, Max Reinhardt, Hans Poelzig, and Erik Charell suffered under the Nazi regime, and were memorialized in 2015, when the Palast inaugurated a sculpture dedicated to their achievements, depicting a stage spotlight, and placed next to the new building on Friedrichstrasse 107. “Colors of Respect” poster designed by Zhoi Hy, became a symbol for the Palast mentality, inspired by the colors of the rainbow flag, designed by Gilbert Baker in 1978. It has since been a symbol of the LGBTI international community. 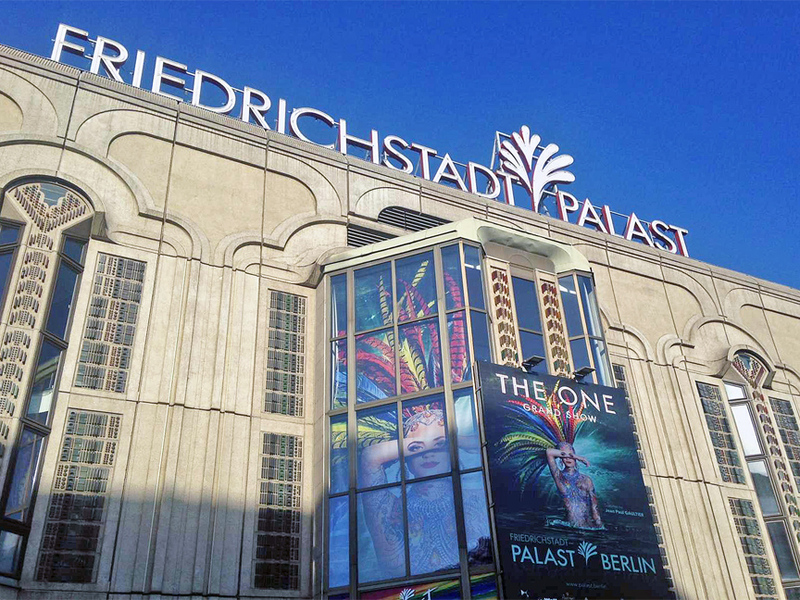 The abundance of rainbow colors spilled out onstage at the Palast current show, “The One,” set to run until mid-2018. 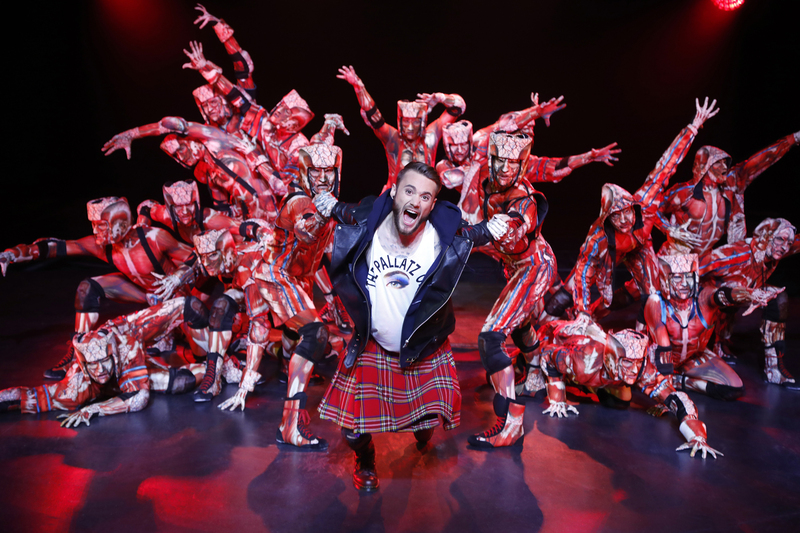 Directed by Roland Welke, with 500 costumes by the world star fashion designer Jean Paul Gaultier, lighting by Emmy Award winner Peter Morse, choreography by Brian Friedman, Craig Revel Horwood, and Marguerite Donlon, and songs by Daniel Behrens, Christian Lohr, Gregor Meyle, Maya Singh, and KT Tunstall, the show features Roman Lob and Brigitte Oelke as solo artists, and more than 100 of their colleagues from 26 nations. On my short two-day visit to Berlin I was lucky to catch a Staatsballett Berlin show “The Sleeping Beauty” by Tchaikovsky, performed at the Deutsche Oper Berlin. Berlin’s new State Ballet Company – Staatsballett, founded in 2004, was created by merging the previously independent ballet companies at Berlin’s three opera houses. Today, it’s acknowledged as one of the world’s leading ballet companies performing in three venues – the Deutsche Oper Berlin, the Komische Oper Berlin, and the Staatsoper in the Schiller Theater. Starting with the 2014/2015 season, a renowned choreographer and director Nacho Duato took over as Artistic Director of the Staatsballett Berlin, bringing in a wealth of experience and his own much admired choreographic techniques. 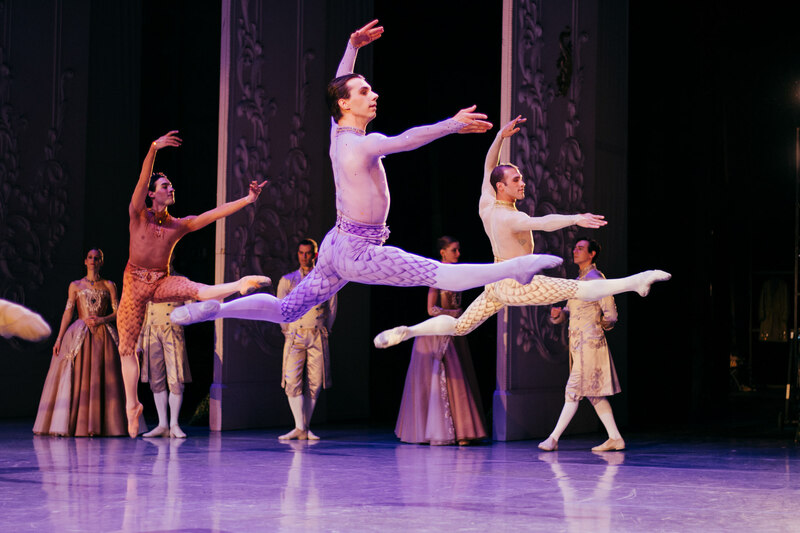 The company’s dancers present the entire range of the ballet repertoire including all of Tchaikovsky’s ballets as well as neo-classical and contemporary works. “The Sleeping Beauty,” choreographed by Duato, with set and costumes by Angelina Atlagic, lighting by Brad Fields and musical direction by Robert Reimer (Deutsche Oper Berlin orchestra) featured Ksenia Ovsyanick as Princess Aurora and Marian Walter as Prince Désiré, supported by the talented ensemble. The entire ballet was performed with abundant energy and skill, however, Rishat Yulbarisov in the role of the evil Carabosse completely stole the show. The 6’4” agile and highly powerful dancer, clad in a shiny strapless black dress with a full skirt of rustling ruffles, dominated the stage in his every graceful move, surrounded by a soundless, acrobatic team of the evil witch’s shadowy sidekicks – Alexander Abdukarimov, Taras Bilenko, Joaquin Crespo Lopez, Artur Lill, Lucio Vidal, and Wei Wang. (Currently on summer break, the show will resume on September 15). Gay Berlin was on my mind while I was traveling on U-Bahn with my trusty Berlin Welcome Card. On U-5 line construction site there was a depiction of a train car with passengers of different races, ages, genders, and sexual identities sending a clear message of inclusivity and acceptance. CSD Berlin was advertised – the coming up on July 22 Christopher Street Day a.k.a. Berlin Pride. The first CSD took place in 1979, and since 1993, the gay/lesbian city festival has been celebrated every year becoming the largest of its kind worldwide. These days, up to 750,000 people celebrate the CSD in Berlin with more than 50 floats moving toward the Brandenburg Gate. Apparently, Berlin was considered the gay capital back in the 1920s. Despite the financial struggles of the time, a vibrant scene of bars, clubs, and cabarets existed in numbers still unrivalled today. According to some historical accounts, there were about 400 venues for homosexuals at that time, ranging from the famous cabaret Eldorado (closed down by the Nazis in 1932) to the ladies’ dance hall Zur Manuela, and to the large balls organized by various homosexual associations. As early as 1897, Magnus Hirschfeldfounded, a German Jewish physician and sexologist, founded the Wissenschaftlich-Humanitäre Komitee (The Scientific-Humanitarian Committee) in Berlin as the first ever gay and lesbian human rights organization. From 1919, he ran the legendary Institut für Sexualwissenschaft (Institute for Sexual Science), which made an important contribution to the emancipation of gays and lesbians all over the world. After the suppression of the entire gay and lesbian community and subculture by the Nazis, it wasn’t until 1971 that the homosexual scene recovered again – which is when the gay movement Homosexuelle Aktion Westberlin (Homosexual Action West Berlin) was founded. Today, Berlin is one of the most open and tolerant cities in the world. Gay bars, clubs and parties as well as wide-ranging cinema programs, the Gay Museum and many other venues and events, including the annual CSD, for LGBTI community, are readily available and well-attended. VisitBerlin website provides tips, practical information, and points of contact for gay, lesbian, bisexual, transgender and intersexual people. 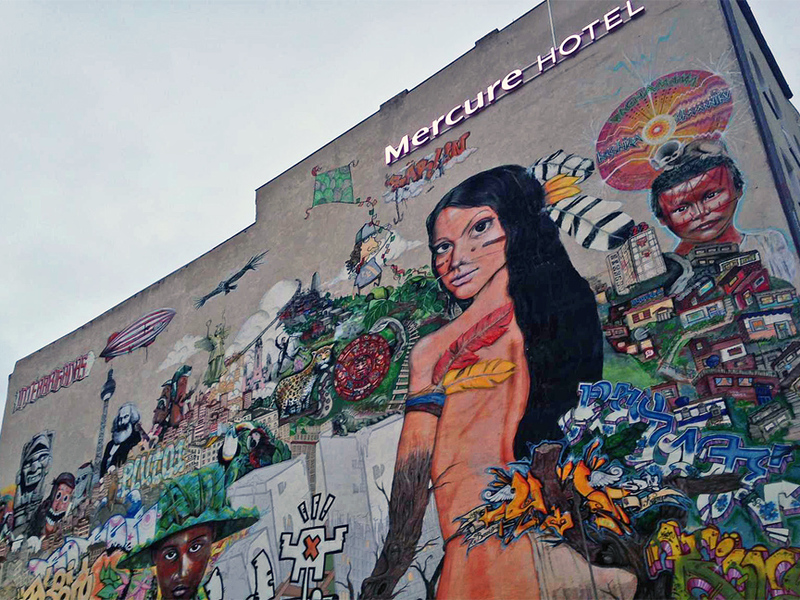 LGBTI-friendly hotels in Berlin are listed in Pink Pillow Berlin Collection. All participating hotels have signed the gay-friendly hotels promise: to treat all guests with same courtesy, dignity and respect; to actively contribute to social LGBTI projects; to create a work environment of respect and tolerance; to offer guests information about the LGBTI scene; to participate in VisitBerlin’s semi-annual LGBTI information days. Find more information at: https://www.visitberlin.de/en. Press images: Friedrichstadt-Palast “The One”: photography by Sven Darmer. Staatsballett Berlin “The Sleeping Beauty”: photography by Yan Revasov (Princess Aurora) and Ed Shelley (male trio).